The Mississauga Touch Football League is always actively promoting the game of football. Here are some links to other leagues and organizations involved with football. (Ottawa) Touch Football Ontario (TFO) is based in Ottawa and is the primary portal for most touch football leagues based in Ontario. (Toronto) The MTTFL offers both Fall & Spring/Summer leagues. Very competitive and organized. (Mississauga) A Mississauga based league, providing full tackle football and flag football for the youth of Mississauga for over 40 seasons. Teams available for youth age 7 - 17. 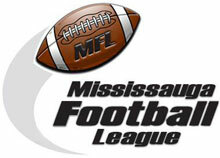 The MTFL entered into a joint partnership with the MFL beginning in the 2011 season. The focus is to help them in several ways with the ulitmate goal of growing the sport of football in the City of Mississsauga. (Mississauga) A very exciting flag football league for women in the city of Mississauga. Very well organized with individual player awards and stats tracking. (Oakville) Great League in Oakville Ontario established in 1981. Creates new teams every year by drafting players. (Burlington) A long standing league starting back in the 1960s, now with 5 divisions of play and based in the city of Burlington. (Rexdale) Very fast, 6-on-6 game played all year round. Games played at Wild Water Kingdom & Soccer Centre by Martingrove & Hwy 427. (Hamilton) The HTFA has four divisions including a womens division and plays games on Saturday mornings from early May until Championship Day in early October or late September. (Kitchener/Waterloo) Over 40 years of excitement in competitive touch football for adults in Kitchener, Waterloo, Cambridge, Guelph & surrounding areas. (Sault Ste. Marie) Running for over 30 years. The league runs the week after Labour Day running to late fall. (Oshawa) OTFL consists of 10 teams, with 12-14 players per team. (Ottawa/Napean) The Ottawa Nepean Touch Football League (ONTFL) has approximately 1900 men and women participating in any one of 14 divisions of play including separate divisions for Men, Women, Co-Ed and Masters. (Edmonton) A big touch football league in Edmonton. Five men's divisions and one women's division. (Red Deer) A large one division league with a lot of competition based in Red Deer, Alberta. (Winnipeg) The Winnipeg (Centennial) Touch Football League, has been in existence since 1974, and is organized and run by a volunteer board of interested league members. (Vancouver Area) Touch Football BC is located in beautiful British Columbia, Canada. Games are played in Vancouver, New West, Surrey, Burnaby and Coquitlam. (Victoria) The Victoria Touch Football League has been running for more than 25 years. The league plays CFL rules, three-down football with seven players per team on the field.